Gluten grains—wheat, especially—hide behind many different trendy-sounding names, offering up a potential gourmet minefield for people with celiac disease and non-celiac gluten sensitivity. Many products sound as if they might be gluten-free (and you may even hear someone say they're gluten-free), but they're not, and you need to avoid them if you want to stay safe on the gluten-free diet. Restaurants and health food stores are particularly risky places when it comes to these seven grain products. Labeling on these grains isn't always perfect (and doesn't always state "contains wheat"), and so servers and store managers can be fooled easily by them, too. 1. Orzo: It looks like rice, it acts like rice, it's often combined with rice into a tasty pilaf dish. But it's most definitely not gluten-free. 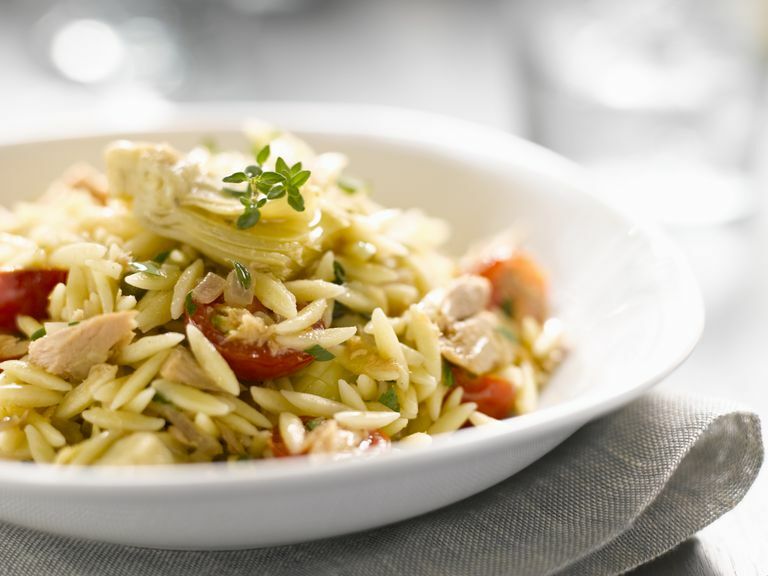 Orzo is a type of pasta made from semolina wheat flour. As I said, watch out for it mixed into rice pilaf dishes (where it can be exceedingly difficult to spot), in soups, on top of salads, and under sauces. 2. Couscous: Couscous, a favorite in Mediterranean dishes, also looks a little like rice (but not as much as orzo). When cooked, it also resembles other gluten-free grains, such as quinoa and millet. Don't be fooled: couscous is made from durum wheat flour. Nonetheless, it's possible to find gluten-free couscous—just be sure that's what you've got before you use it! 3. Einkorn: This gluten-y grain hides in plain sight: it doesn't make any bones about being a form of wheat, but many claim that—because it's an ancient form of wheat—it won't affect those people who have celiac disease or non-celiac gluten sensitivity. I've heard anecdotal reports from a few people who've had good experiences with Einkorn (and its close relative Kamut), but medical research indicates these ancient wheat varieties do contain some gluten, and potentially can cause immune system reactions in people with celiac disease. I'd steer clear. 4. Farro: This seems to be the grain-du-jour in some gourmet and health food specialty stores. All of a sudden, half the salads include farro, and the stores are selling small bags of the grain for $7 apiece. But what in the world is farro? I confess I didn't know at first (although it looked a bit suspicious). Fortunately, I didn't bite before I researched, and as it turns out, farro refers to various forms of ancient wheat. As I report above, ancient wheat is still wheat, and it still contains gluten. 5. Seitan: Seitan, a bland, chewy substance also known as "mock duck" and "mock meat," appears in many vegetarian and vegan dishes — especially Asian dishes — as a protein-rich meat substitute. But if you react to gluten, you'd probably prefer to be in the next county over whenever a package of seitan is opened — the stuff is pure wheat gluten. 'Nuff said. 6. Freekah: This is another popular vegetarian and vegan protein source. Unfortunately, freekah (also known as frik or farik) is made by taking unripe wheat kernels and toasting them. Your body won't care if the wheat is green or golden brown — it will still object (possibly vociferously). 7. Organic Wheat: Organic wheat is simply wheat grown without synthetic chemicals. It's genetically identical to wheat that's grown conventionally, and it most definitely contains gluten. Yet I've heard quite a few people question whether it's gluten-free, or (even worse) state unequivocally that it is gluten-free. Take my word for it: organic wheat most definitely is not gluten-free. Those of us who follow the gluten-free diet are fortunate that there are tons of truly gluten-free grain products on the market that we can use in place of these unsafe ingredients, regardless of whether we're making a rice pilaf or a loaf of organic gluten-free bread. If you're craving couscous, for example, there are gluten-free varieties available. And if you want an interesting grain to mix with rice or into a salad, check out 5 Interesting Gluten-Free Grains To Try. Just be aware that gluten-y ingredients like orzo, couscous, and the others can sneak into dishes where you might not expect them, and the people who make those dishes might not even realize their ingredients contain the evil protein gluten. Beware, and keep this list handy. What Exactly Is Farro and Is It Gluten-Free? Can You Have Sprouted Grains If You're Eating Gluten-Free?